Front suspension Independent unequal length wishbones, telescopic dampers, coil springs. Instruments Speedo, Tacho, water temperature, Volt Meter, Oil Pressure, fuel gauge and clock. Barrel switch for head and side lamps. The last variation of the Opel Manta was a modernised version of the preceeding model. In 1981 the range was revitalised for the last time and a new engine option added. The 1.8 litre LET (Low end torque) Over head Cam engine was offered initially in the new Manta GTJ and Berlinetta. The exisiting 2.0 litre, which now included Bosch Fuel injection, made a return later in 1982 in the form of the GT/E. Several bodywork changes were made, with integral deep front spoiler and Rear spoilers on both the Hatchback and Coupe models. 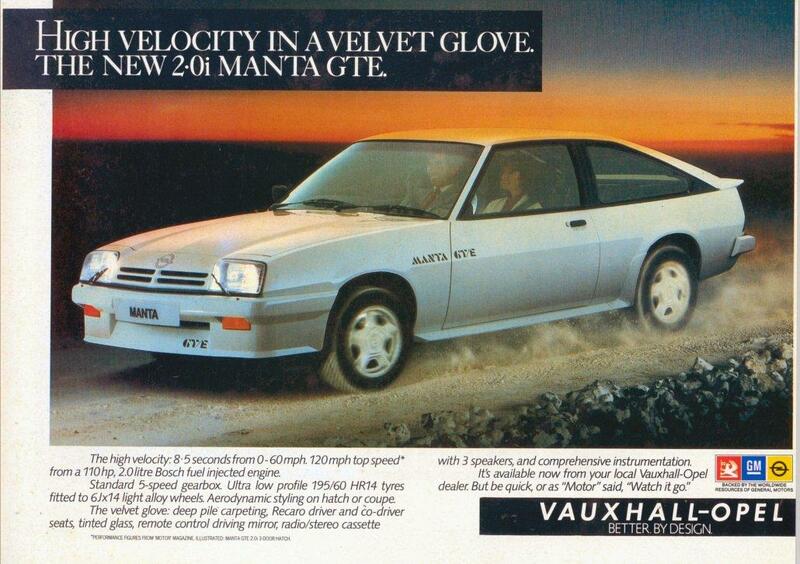 All traces of chrome had now dissappeared to bring the Manta in line with the 'clean' trend of the eighties. The new model featured many mechanical enhancements, which made the Manta a market leader in certain areas. A 5 speed gearbox was offered as standard on UK models and the level of instrumentation was increased to give every model an oil pressure gauge and volt meter. The ignition was now electronic on all models, helping to increase the specified service interval considerably. The facelifted Manta still owed much of its running gear to the more mainstream models, such as the Opel Ascona, (or the Vauxhall Cavalier in the UK), but the new styling components made the car look much more 'modern'. The colour -keyed wrap around bumpers, front and rear spoilers and sports wheels gave the car a new look. The addition of tinted glass and a front windscreen with a graduated 'shadeband' also echoed the styling trends of the day. The front nose cone now sported 4 small slots, as opposed to the 2 larger ones of the preceeding model. This helped to improve cooling efficiency and also made the car an imposing sight in your rear view mirror ! In all the Manta had come of age and was considered by many, to be at the forefront of Coupe design and technology. The new Model now had an astonishingly low drag coefficient. Manta roadholding and overall handling precision are sharp and responsive. A finely tuned coil and spring suspension set up, incorporating anti-roll bars, strikes the perfect balance between comfort and grip, a balance that most manufacturers seem to have forgotten how to acheive nowadays. Sensitive and accurate rack and pinon steering has just the right amount of feel to keep you informed of road wheel behaviour. Many leasons learnt running the successful Manta 400 International Rally car, were put into the design of the road car styling and roadholding ability. GM Strasbourg automatic transmission was available as an alternative to the standard five-speed manual. The transmission choice is basically down to what you prefer as they are both good, the automatic being more lively than you would expect. Other options available were Sliding steel sunroof, headlamp wash-wipe, rear wiper to name a but few. Many of these items were later incorporated into the range as standard. Not surprisingly the Manta collected quite a few bouquets along the way. Autocar magazine said : "....it provides a typically refined GM package at a price which is more than competitive with its rivals.... in the performance car value-for-money stakes, the Manta GTE is now one of the front runners." Motor magazine gave the Manta the thumbs-up with: "It's still hard to think of any rival that can match it's combination of practicality, roominess and stylish looks, let alone its new found economy and refinement...... And on top of that it's damn good fun thanks to punchy performance, an exquisite gearchange, and terrific handling.....nice one Opel!" Following on from previous Opel ranges, the new facelifted Manta also sported the Berlinetta name. Once again it was the extra comfort model with better soundproofing and a more luxurious trim level as standard. The fuel injected GT/E become the model that most people associate with the Manta. It was a very well appointed model, the 2.0 litre engine gave superb performance and the stylish Recaro Interior that was introduced for this model gave the car an even sportier feel. Offered in 2 body styles and many colours, this model was very well received by the public. 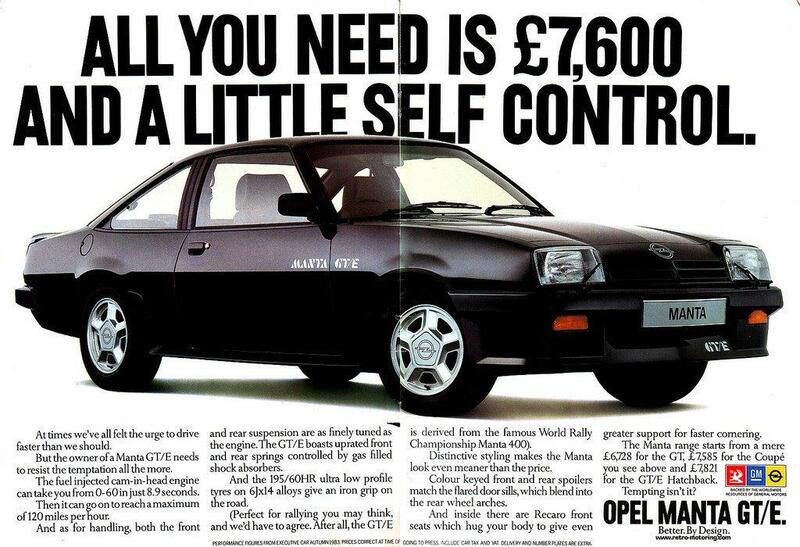 The GT/E Exclusive was the final incarnation of the Opel Manta. 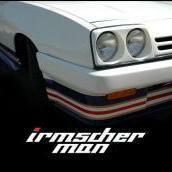 It was initially made as a special edition model by Irmscher, the Opel owned Styling and Tuning company. This model featured specially moulded Twin Headlamps, (the first car to sport such items) and a rear spoiler on the coupe, derived from the Manta 400 rally car. All the modifications were cosmetic, but it gave the final years of Manta production a new lease of life. The 1.8 Exclusive Hatch was the replacement for the GT. It was the final model available with the OHC engine and hatchback body style. Featuring the twin headlamps and a revised level of trim, it offered great value for money. It remained in production for just 12 months but was sold in quite large numbers begging the question why the such a popular model was ceased. The i200 was a strictly limited edition model, converted by Irmscher GmBH to homologate the Opel Manta into the FISA group B rally category. The 2.0l engine received special treatment to increase the power output to 136 bhp. The front square headlamps were replaced by a pair of twin lamp pods and a large rear spoiler was added, both taken directly from the Opel Manta 400 model. A completely new interior was fitted featuring an Opel Blitz design fabric on the Recaro seats. The models were considerably more expensive that a standard GT/E at the time and this, very few of these cars were ever made in RHD. Due to the i200's status as a fully paid up member of Group B, they have become very collectable. The Manta 400 was the jewel in the Opel crown of the 1980's. It was the full blown rally example being, like the i200, homologated into the FISA Group B rally category. The road going version was fitted with a twin cam 2.4 litre engine, derived from an Opel Rekord diesel bottom end fitted with a specially designed cross flow Cosworth Cylinder head. 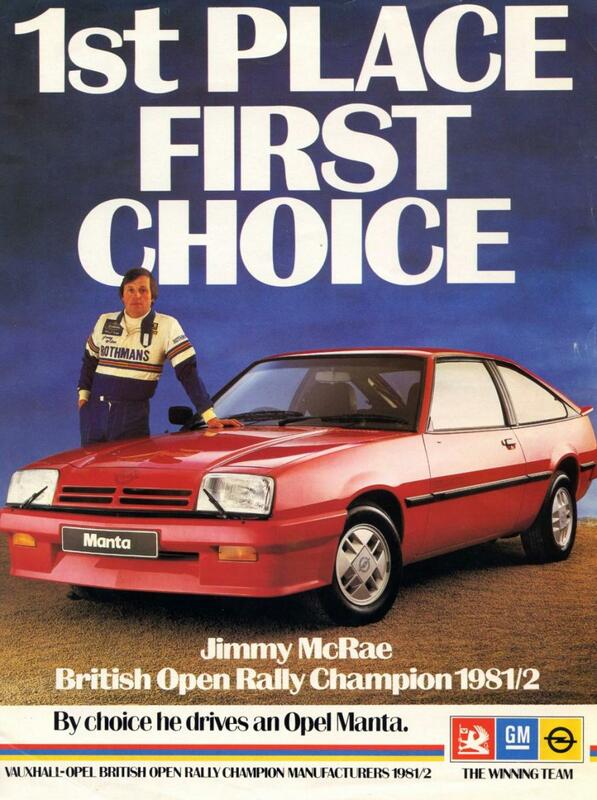 Power in tuned rally form, could top 400bhp, but in the road form it was much tamed. The road going versions were also fitted with the Opel Blitz interior and featured as standard a Limited Slip Differential and a rally sport gearbox. It was generally regarded as being the best normally aspirated rear wheel drive car of its time and its considered by most to be the Holy Grail of Manta ownership. When Chris Courtenay got hold of a Manta in the mid eighties, he breathed fire into it and another legend was born ! The Courtenay Turbo Manta was an aftermarket conversion, but is still worth a mention due to its high quality of construction and phenonemal power output. By chaning the compression ratio and fitting a turbocharger, the Manta had power to spare. The clever use of an electonic boost mechanism, frequently coppled with water injection, made the car powerful but still driveable everyday. Several examples exist in the UK of this firebreathing Manta.